Francis Norwood was born circa 1635 in England. Francis married Elisabeth, the daughter of Clement Coldham and Mary Pierce of England. Elisabeth and Francis were married in Essex County, Massachusetts on the 15th day of October in the year 1663. Their son Joshua Norwood married Elizabeth Andrews who was born in the town of Ipswich in Essex Co MA. 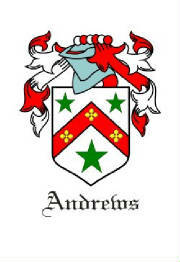 Elizabeth's parents were William Andrews and Margaret Woodward of Massachusetts. On November 28 1723 a daughter was born to them. They named her Abigail. Abigail married Josiah Lane from another Essex Co MA family. Son, Levi was born to them in 1754 in Annisquam, Essex Co MA. Levi became the father of Hannah Lane, the grandmother of Eva Moring. Eva was the wife of Dr. Arno Behr of Prussia, Chicago and Pasadena, California. To learn more about the Lane family please view the Lane Family page links at the bottom of this page. Annisquam, Massachusetts, home of the Lane Family. "Lane Family" by Fitts, p 234 Vol. three.